News: Marvel Creativity Studio Stylus and iPad app lets you draw digital comics the Marvel way on your iPad! The latest in our series of guest columns about ‘why I love digital comics’ comes from Madefire co-founder and digital pioneer Liam Sharp. 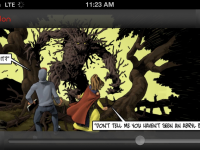 Already publishers some of the finest digital graphic novels on the iPad, today Sequential, the literary graphic novel app company, have announced a partnership with venerable UK publisher Jonathan Cape to make digital versions of their graphic novels available on the iPad for the first time. Anounced today, you can now get motion book publisher Narr8’s unique brand of interactive series on your iPhone as well as your iPad. Here in the UK we’ve been lucky enough to enjoy Panel Nine‘s literary graphic novel app Sequential for a couple of months now, but today it is set to be released worldwide.